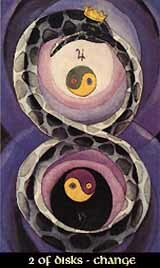 The Two of Disks represents the Earth in Chokmah, the realm of creation and energy, directing the pure material resources of the Ace towards a specific goal, in order to change from the raw material to the actual creation process. Further, the card is called Harmonious Change, it stands for the alternation and natural balance of gain and loss, weakness and strength, growing and fading, ever varying occupation and wandering. In nature, everything is in constant change, well balanced with and in each other, building the principle of natural growing and proceeding. The Two of Disks reminds us that we are still part of that nature, that we have to accept the natural flow of changes and handle it with care and consideration. Shadow: Imbalance, the inability to accept a change, clinging to a status quo that is about to fade or change.